Just like the previous months, December is coming with its series of Daily Missions, however, the final reward this time is a ship that deeply influenced the arms race between nations. Ladies and Gentlemen, this month, you can obtain the HMS Dreadnought! How to get the ship? Well, there is nothing more simple. From 1st December to 31 December, a total of 62 Daily Missions chains will be available and among these 62 Missions chains, you will have to complete 40. Each day, 2 Daily missions will be available and you can complete them in Operations, Random battles, Ranked battles as well as Co-op battles. You can only accomplish these missions with ships of Tier V to Tier X. Once these 40 missions completed, this legendary ship will be yours. If you are enjoying the Twilight Battle mode then this might pick your interest. – Steel Rat (Z-23): Win 15 battles with any ship of The Dark Forces. All ships are provided with a 19 points captain. Also, as a reminder, you can also unlock Rasputin by winning 50 battles with any of the Halloween event ships. Finally, from the 30 November to 04 December, if you have spare doubloons and are a fan of British warships, it is your chance! 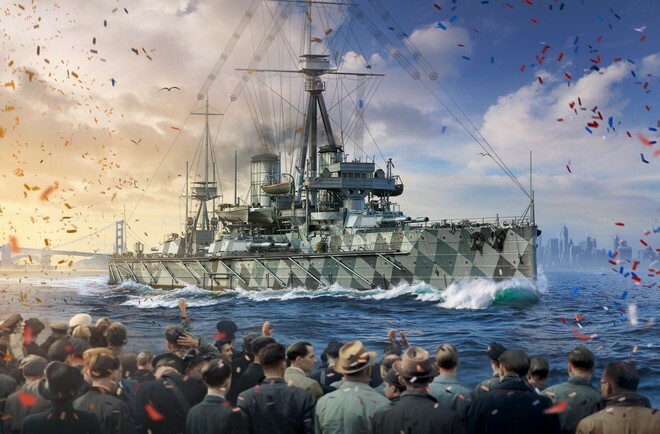 During this period, the Tier VI battleship Warspite, the Tier VI cruiser Perth as well as the VII battleship Hood will be available for doubloons with a discount of -30%. Also, for the first win of the day, you will receive an additional +50% XP bonus.